Linksys launched its line of 802.11ac Access Points in 2014. Their flagship model, the LAPAC1750PRO [reviewed], included a clustering feature that allows one Access Point (AP) to act as a controller for other Linksys APs. In March of 2016, Linksys extended this clustering feature to all its 802.11ac small business APs, which includes the LAPAC1750PRO, LAPAC1750, and LAPAC1200. 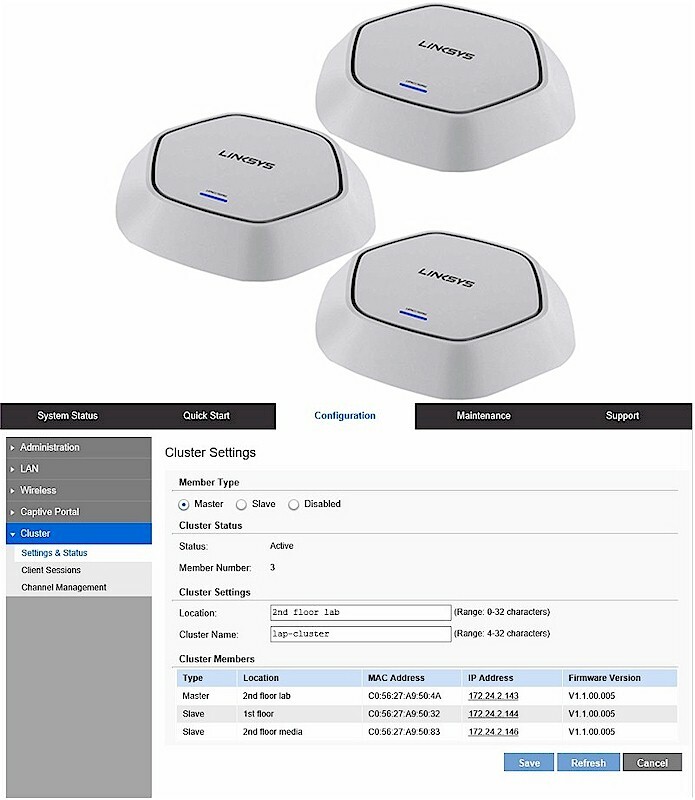 Clustering is scheduled to be available on Linksys' 802.11n small business APs, which include the LAPN600 and LAPN300, later in summer 2016. This review will take a closer look at Linksys' AP clustering feature. Linksys sent three LAPAC1200s for our review, which were installed in various areas of a two story building. This AC1200 class AP has internal antennas and is housed in a white hexagonally shaped plastic case measuring approximately 9.5" across by 1.7" high. The size seems a bit larger than similar APs I've tested from other vendors, yet is still manageable. The LAPAC1200 includes mounting hardware, AC power adapter, installation disk and an Ethernet cable. Installation was basically plug and play. The LAPAC1200 supports Power over Ethernet (PoE), so I powered one of the APs off a ZyXEL GS1100-8HP PoE switch and the other two via their AC power adapters. All three leased an IP address from my router and I was able to connect to the configuration web GUI on each one. There is a single LED on the AP. When the LED is green, the AP is up and running. When the LED is blue, the AP has at least one wireless device connected. I was able to access the LAPAC1200 via Chrome, Firefox, and Microsoft Edge from a Windows 10 PC, as well as via Safari from an iPhone. There is no remote management tool or cloud based portal for the LAPAC1200. Thus, your PC, handheld, or tablet either needs to be on the AP's LAN, have routed access to the AP's LAN, or have VPN access to the AP's LAN to manage the LAPAC1200. I logged into each device with the default user name and password and factory reset each one to ensure I was starting out with a clean slate. The LAPAC1200 menu is responsive, with a similar intuitive layout and feel as the Linksys LRT214 and LRT224 small business routers previously reviewed . I like how you don't have to open a manual to configure a Linksys small business device. Clicking help while anywhere in the Linksys configuration menu brings up useful information on that configuration option in a separate window. The screenshot shows the help menu for the clustering option. Linksys also has an Initial Setup Wizard to simplify setup for standalone APs. The Wizard will walk you through setting up the admin password, time and network settings, plus wireless SSIDs and security. With Linksys AP clustering, you have the ability to control up to 16 APs from a single AP. In a Linksys AP cluster, one AP serves as a master, the other APs take configuration updates from the master. The AP serving as master continues to function as an AP. One of the slave APs can also serve as a backup master in case the master fails. Wireless (mode, SSID, security, rogue AP, scheduler, connection control, advanced, and captive portal), network (rate limit, QoS, Ethernet port, and VLAN), security (user accounts and management access), and management (time, log, discovery, and IGMP) settings on multiple APs can all be configured through the master. Another bonus, there are no license fees to use the clustering feature! To test Linksys clustering, I configured the 2.4 GHz and 5 GHz radios on the master AP with an SSID (up to 8 SSIDs can be created per radio), set security to WPA2-Personal (WEP, WPA, Enterprise, and RADIUS also supported) and input a passkey. I saw that my wireless configurations were propagated to the slave APs within seconds. The Linksys wireless menus on each AP allow you to configure SSIDs, as well as other wireless settings, such as setting auto-channel (default) or a statically setting a specific channel. I set my SSID and wireless security settings on the master AP to be propagated to the slave APs, and otherwise left the channel settings on each AP at default. The cluster menu also has a Channel Management option. The cluster channel management option is designed to reduce channel interference between devices in a cluster, as well as with devices outside the cluster. This is disabled by default, so I enabled it. However, wireless transmit power is controlled individually on each AP, not as part of the cluster channel management option. As you can see in the below screenshot, my cluster of three APs, all physically within Wi-Fi range of each other, are on different 2.4 GHz and 5 GHz channels, effectively allowing for maximum use of Wi-Fi bandwidth. Other key features of Linksys AP clustering are the ability to see the status/health of all APs in the cluster, view all connected wireless users (Linksys AP clustering is targeted at deployments with 10-100 wireless users), as well as deploy a captive portal (discussed below) for Wi-Fi security. Linksys AP clustering does not support load balancing (distributing clients among APs) or fast / seamless roaming between APs. In my mind, load balancing may be less needed for a small network, but seamless roaming is a desirable feature in a multi-AP environment.